At the Friday morning Farmer’s Market in downtown Livingston, Montana, a hearty lot of vendors display their summer bounty. It’s early. The sun hasn’t yet peaked over the historic brick buildings; businesses remain closed and the streets seem to sleep. But the burst of color that comes from Beth Ridgeway’s baskets of heirloom tomatoes brighten the day. At another table, deep green kale, long-stemmed carrots and beets stacked on a blue gingham tablecloth offer a flash of color. Baked goods and hot coffee tempt the handful of customers who fill their bags with fresh produce grown just down the road, and on the corner at Adagio, the local trattoria, a sign touts breakfast burritos. Local chefs who’ve come to buy from these stalwart farmers are intermingled with regular customers. The Livingston Bar and Grille chef buys several pounds of mixed heirloom tomatoes and fresh herbs from Ridgeway for a special evening menu item. Jim Liska, Adagio’s proprietor, incorporates fresh produce from local farmers on his menu every week. Later, Ridgeway, owner of Sol Organics, will deliver more tomatoes to The Beanery, another restaurant in town. 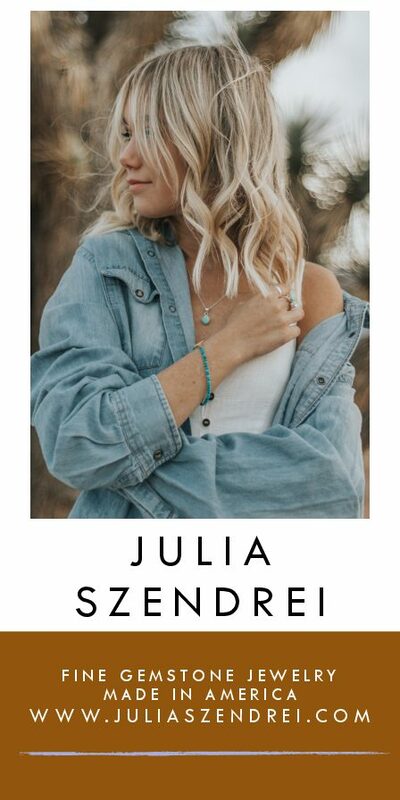 This downtown market started last summer as part of the Western Sustainability Exchange’s (formerly Corporation for the Northern Rockies) effort to connect farmers and ranchers to commercial markets. The result is a growing Farm to Restaurant program that has linked more than 35 restaurateurs from Billings to Big Sky to over 70 local producers of natural and organic vegetables and livestock. Since Ridgeway started her business four years ago, growing tomatoes and herbs in the summer months and Asian greens in the winter, she has noted an increased interest from consumers. During the peak of summer she produces roughly 180 pounds of tomatoes each week; they sell for around $4 per pound and she can’t keep up with the demand. That’s just the feedback WSE’s market connections program director, Annie Conley wants to hear. “We do not produce enough food in Montana yet to fulfill every need, so every restaurant that participates in this program is a hero,” she says, referencing the difficult growing conditions in our northern state. Yet Montana has 60 million acres in agricultural production, so the question Conley and the staff at Western Sustainability Exchange (WSE) ask is: How many of those acres are managed with sustainable stewardship? WSE is a nonprofit whose mission is to advance sustainable choices that enhance economic opportunities that preserve open space, wildlife habitat, farm and ranchlands and quality of life for future generations. According to Conley and WSE executive director Lill Erickson, more farmers and ranchers share that vision. 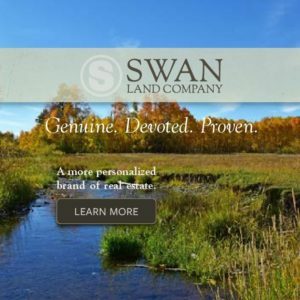 To date, the organization has reached agricultural producers in Montana who now conserve 472,000 acres of grassland and riparian areas. The WSE’s mission is multi-layered, but primarily involves working with agriculturalists to promote healthy land management in order to preserve natural resources for all of us. In short, buying local is good for everyone. That’s a fact that Albert McDonald and his partners at Montana Ale Works have determined too. As general manager of one of Bozeman’s busiest restaurants, McDonald notes that his menu declares: Ale Works is proud to offer locally sourced, sustainably-grown products. Scanning down the list of eclectic and delicious culinary offerings from Ale Works’ executive chef and partner, Roth Jordan, there’s a peppering of organic greens and local products, most impressively in the way of high quality meats served: a New York strip steak and a half-pound Kobe beef burger from the Montana Wagyu Cattle Company in Gallatin Valley; a hand-cut natural Western Plains bison tenderloin; C-5 Burger made from local, natural beef; and the best seller, a spicy J-Bar-L Burger made from all natural Montana beef. McDonald points out that 20 percent of the menu is local or organic and most notably, the Gallatin Valley Salad made of 100 percent fresh local greens from Gallatin Valley Botanicals and goat cheese from Amaltheia Dairy in Belgrade. “WSE is the only umbrella organization that is on a mission to improve the market for small, organic, sustainable farms. The truth of the matter is that farmers aren’t good marketers; they often don’t understand how to connect with vendors. WSE has given farmers the tools to successfully connect with us as a restaurant business,” McDonald states. The WSE Farm to Restaurant program, along with Livingston farmer’s markets and Market Connection, which promotes sustainable products from farmers and ranchers to culinary and natural food markets all year, have been the organization’s most successful efforts since it was started in 1994. 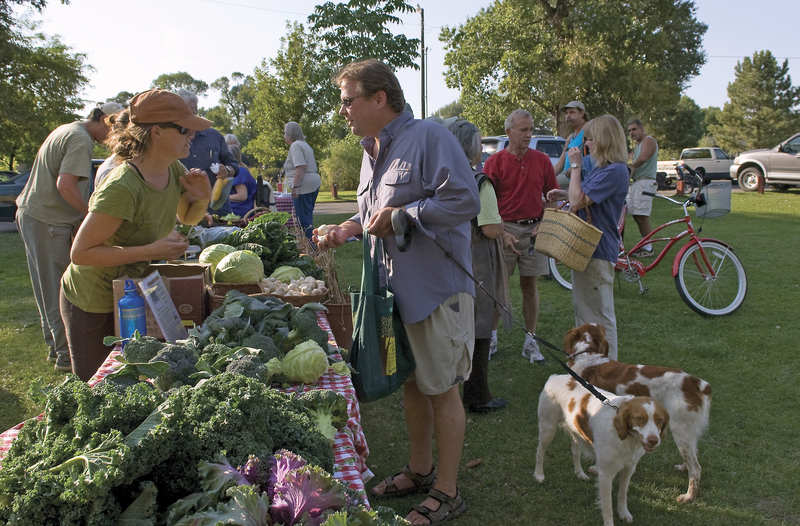 At other independent farmers’ markets around the state (and the country), consumers are recognizing the value of buying fresh food from farmers in the neighborhood, so to speak. It’s hard to argue against the fact that fresh food tastes good. And, even better, local business people who use conscientious practices without chemicals and with measures to conserve energy and farm land grow it. It feels good to support that. Some might argue that buying local, sustainable vegetables and meats is more expensive. Technically, that’s true. But Lill Erickson can rattle off a dozen statistics that would support the fact that the long term benefits far outweigh the extra dollars spent. According to WSE’s most recent annual report, in 2007 they generated $150,000 in sales for sustainable producers through the restaurant program and facilitated another $350,000 in sales of beef, lamb, pork, fish, grains and produce for regional producers with Yellowstone concessionaire Xanterra. In the same year, the group drew producers from communities as far as Big Sandy, Dillon, Billings, Gardiner and Red Lodge to sell a total of $100,000 over just 17 weeks in Livingston. Xanterra’s restaurants serve over 1 million diners each year. 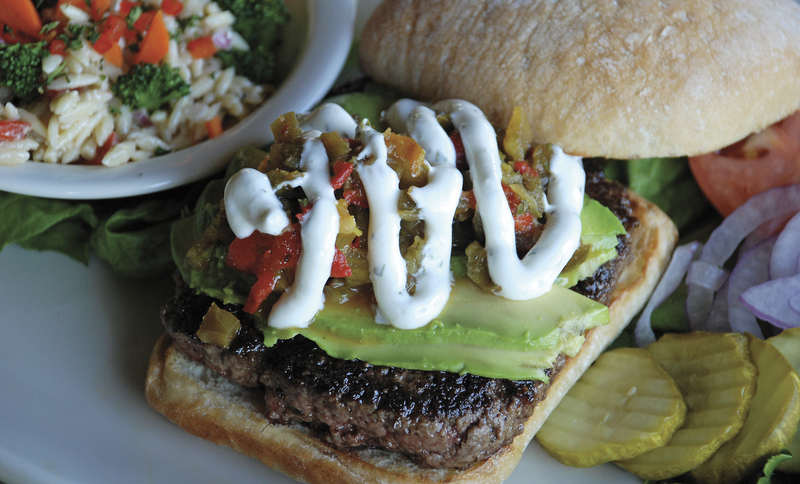 On the menus only natural Montana Ranch Brand beef burgers from Billings are offered, fresh seafood from Bozeman’s Montana Fish Company and top-selling cuts of lamb from Wolf Ridge Lamb and Wool Company in Paradise Valley. These special items are notated with a “green earth logo” and lately the menus at Chapman’s restaurants are practically polka-dotted with that symbol. WSE’s efforts make the point that sustainability isn’t just about marketing catch phrases such as organic, grass fed, all natural; sustainability also means supporting your community, buying from producers who live and work in our towns and in our state. By doing so, we will build stronger networks, socially, economically and culturally. There are other equally committed organizations in the state who support sustainability through agriculture, among them are Livingston’s Farms for Families, Gallatin Valley’s Farms to Schools initiative; the Bozeman Community Food Co-op’s Farm to Market endeavors; Grow Montana; the Sustainable Farmer’s Union; AERO (Montana chapter); the Northern Plains Resource Council; Prairie Development Center. Each effort is essential, but WSE is a longstanding group that seeks to find common ground for environmentalists, agriculturists and the rest of us through grassroots efforts and not politics. WSE does not get involved in public policy initiatives or litigation. “We want to provide a neutral ground for people who value natural resources,” says Erickson. And what could be more neutral than the dinner table, where people come together to share a meal? One table at a time, the WSE Farm to Restaurant program has increased visibility for local farms and ranches that practice sustainability. It’s also made it easy for customers to support local farmers by simply ordering off the menu. After all, fresh food tastes good. Editor’s Note: WSE’s annual Harvest Celebration Dinner will be held on Friday, October 2, 2009 at Chico Hot Springs & Resort. Go to www.westernsustainabilityexchange.org for details. 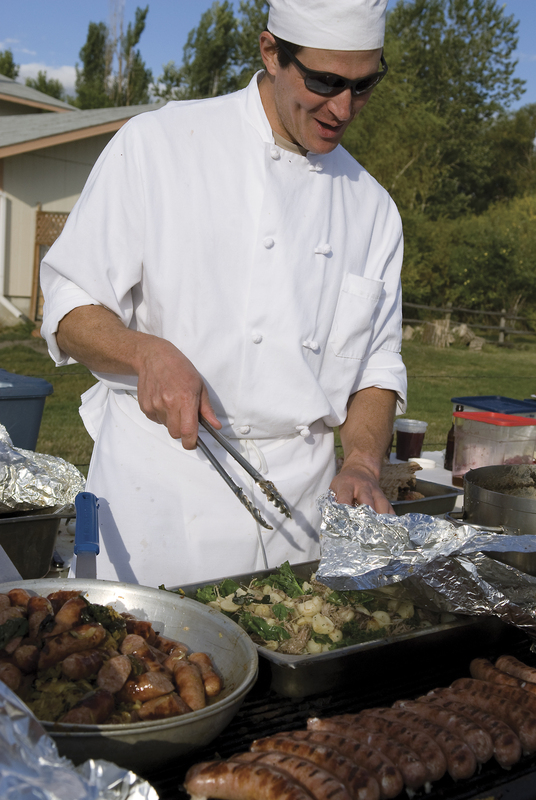 A chef serves up locally harvested and homemade products at the Gallatin Valley Community Farm Tour Feast held at Amaltheia Dairy. Left: A hand-tossed salad of local greens. Center: Sol Organics locally-grown heirloom tomatoes. • Right: Montana Ale Works, a member of the Western Sustainability Exchange’s Farm to Restaurant Connection, serves up the Gallatin Valley Salad with 100 percent locally grown, organic ingredients. 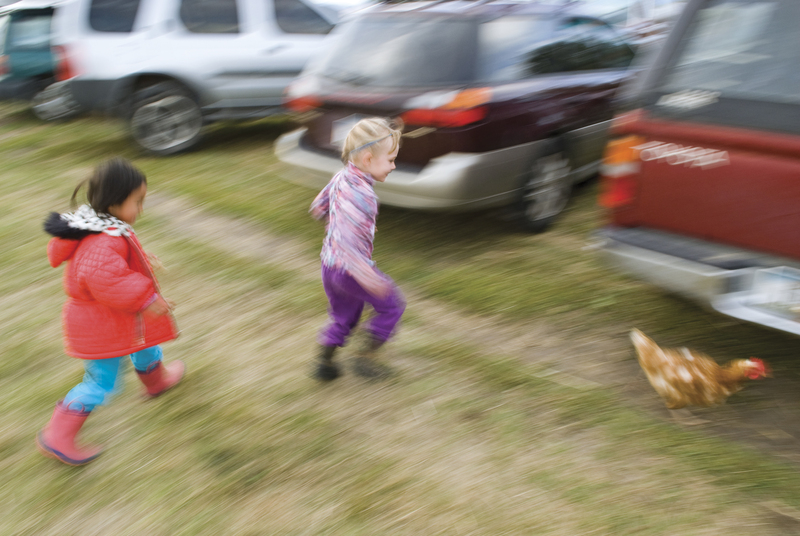 Free range chicken chase at a local feast during the Gallatin Valley Community Farm Tour. Livingston, Montana’s Wednesday Farmer’s Market connects growers to community members and restauranteurs.